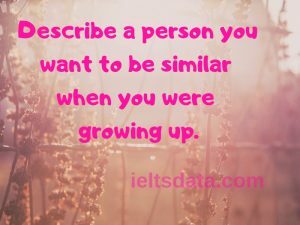 Describe a person you want to be similar when you were growing up. Although, I belong to Hoshiarpur city that is leading our province to the literacy rate. Eventually, I belong to a nuclear family that consists of 3 members my father, mother and myself. Both of my parents belong to the education sector. And there is a great influence on the education sector. And there is a great influence on education in my family. Though from my elementary till my high school, I pursued my education from reputed School known as Mount Carmel that is affiliated to ICSE stream. Hence, I still remember, by the grace of God, I met with my classmate known as Andrew in my elementary. Apparently, as I start growing up with him in my education till matriculation, I recognized that he was a tall good looking student with blue eyes and golden hair and his dressing sense was very much fabulous as well, In the evenings and on the weekends as well. Luckily by the grace of God, he was always elected as a monitor and head boy of the school because of his deep concentration in education. Gradually in high school, people always call him a unique personality because he usually participates and won numerous competitions more likely sports, Quiz, and dancing as well. Apart from that in my high school, I usually indulge with him in social welfare activities more likely arranging free kitchen for needy and homeless people and keeping our city more neat, clean and green as well and donating more and more books and uniforms to the needy people. Gratefully his methodology of dealing with his elders and juniors was very much impressive and mannerful. The friend of mine Andrew who does I always admire and want to be like him. Some people say that schools should reward students who show the best academic results, while others believe that it is more important to reward students who show improvements. Discuss both views and give your own opinion.